Among Doctor Who fans, Robots of Death is a perennial favourite for a whole host of reasons. The visuals are gorgeous: Robots with beautiful facemasks, quilted jackets, metal hands and waves of swept-back metal hair; the equivalent of a mobile oil rig crewed by people in exquisitely odd facepaint and flowing robes, the whole thing is a kind of Murder On the Orient Express, translated to a science fiction setting. The robot voices are so creepily well-meaning, even when they’re intending to kill you, it adds horror to the base-under-siege or locked-room-mystery scenario. Louise Jameson and Tom Baker were both on stellar form, and there’s a playful wit in Chris Boucher’s script (or, as it may be, Tom Baker’s tweakings with Chris Boucher’s script) that give the story a handful of evergreen zingers. What’s more, whether it intends to or not, it delivers a commentary on the age of convenience and the creeping indolence and arrogance that comes with it, which if anything is more relevant today, as we embark on a new age of robot-assisted living than it was forty years ago when Robots of Death strode across our TV screens. Robots was also among the first stories to be released on home video, so it stood as ‘The’ Tom Baker story for some Eighties fans, and has a special place in their hearts to this day. As such, the release of the audiobook version is always going to be a reason to cheer. It’s Robots of Death, and there’s a vein of quality right through the middle of it that it would be hard to tarnish. That said, the Target novelisation by Terrance ‘King of Who Novelisations’ Dicks is…something of a workmanlike affair – slimmer than the material seems to warrant, and ever so slightly blowing the delivery of certain key lines. It’s still very much Robots of Death, and Dicks adds a little to the characterisation of the crew of Boucher’s ‘sandminer’, making clear some things that were not immediately obvious from the broadcast version, particularly as regards the leader of the crew, Commander Uvanov. Nevertheless, there’s little getting away from the fact that the novelisation feels rather less than the sum of its TV episodes, and that feels like a more acute disappointment when it comes to a story like Robots of Death than it would for some of the lesser-regarded stories – an example of the expectation game at work. 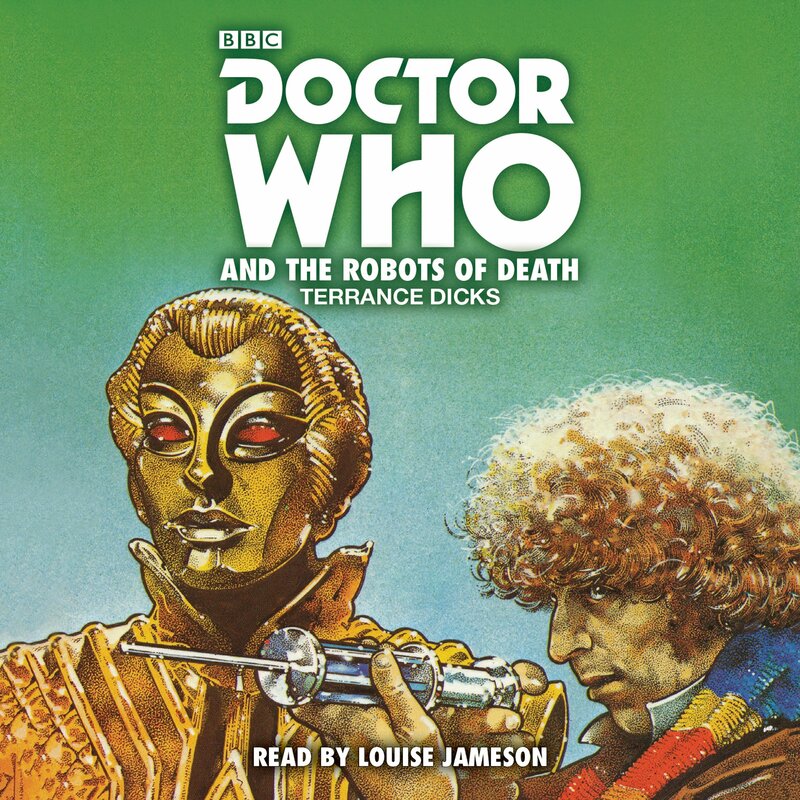 Louise Jameson, who played the Fourth Doctor’s companion Leela in the original TV version of Robots of Death, here jumps up and down the age range of her voice to deliver all the characters which bring the sandminer to life, including both its human and robot crew. She’s especially effective in terms of rendering the robots – while not exactly true to the televised version, the uniformity of her robo-voices conveys the same sense of electronic, unflappable calm that made them creepy on TV. Whether her reading works for you overall though depends on one thing. What were you doing forty years ago? Were you even alive forty years ago? The question’s important because it speaks to an ability to remember tiny points of something that happened to you that long ago. Jameson’s reading overall is evocative and multi-faceted, but if you’re a devoted Who-fan, there’s the chance it will irritate you on a couple of points of pronunciation. A leading character named Toos was pronounced on-screen to rhyme with ‘loose’ and here rhymes with ‘lose’, for instance. Commander Uvanov, while for the most part pronounced as on TV as You-Vah-Nov, pops up a handful of time as Oo-v’nov. And probably the most unusual case of pronunciation-slippage is attached to the main villain of the piece, Taren Capel, whose ‘surname’ on screen was pronounced as ‘Ca-Pell’ but who Jameson here renders – at least consistently – as ‘Capple.’ So the question is whether these differences ruin Doctor Who forever for you, or whether you can get past the fact that it was forty years ago that Jameson was in the story, and simply let her quality of performance shine through and lead you through the robot-infested corridors of the sandminer. The pronunciation-differences will probably only be important to you if you’re a dyed-in-the-wool Who-fan with a DVD collection on standby. Of course, it’s also worth remembering that the people most likely to spend money in 2018 on the audiobook recording of a novelisation from 1979 of a TV story from 1977 are dyed-in-the-wool Who-fans with a DVD collection on standby, so it might be a problem for a higher percentage of the likely audience than you might imagine. So is the Robots of Death audiobook worth getting?